'Lives are changed forever:' Railroaders lean on each other after BC train derailment	. 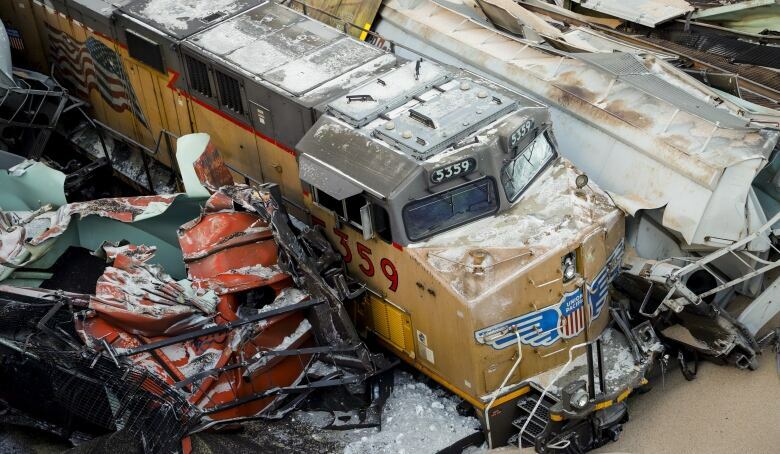 A veteran Canadian Pacific Railway engineer says railroaders are supporting each other after a derailment in the Rocky Mountains this week claimed three of their own. "All the people I work with are incredible professionals and we take care of each other and watch each other," Carl Schnurr of Calgary said Wednesday. A train carrying 112 grain cars and with its air brakes on was parked on a grade before it started moving on its own around 1 a.m. Monday just east of Field, B.C. No handbrakes had been applied. Engineer Andrew Dockrell, conductor Dylan Paradis and trainee Daniel Waldenberger-Bulmer had just taken over from a crew who were approaching their maximum hours. "Because we try and take care of each other so much, this just hurts even more," Schnurr said before starting his work day on the railroad. Schnurr has set up a GoFundMe campaign called the Laggan Relief Fund for families of the victims. By late afternoon Wednesday it had raised more than $57,000. "We need to take care of these families. I can't stress that enough," Schnurr said. "Their lives are changed forever." "He was a very devoted employee and had worked in Alberta, British Columbia and also in Ontario when they had a man shortage," said Ed and Heather Dockrell. They said that he loved golf, the Boston Bruins and had a strong faith in God. He took his job seriously but also made it fun, added Schnurr. He said Dockrell went by the nickname Doc at work. "Andy was a great character to work with. He had a nickname for everybody and it was great working with him," said Schnurr. "He seemed to be always upbeat and enjoyed what was going on and liked to have a good time with his workers." "Dylan was great to work with — big smile on his face, enjoyed his job," he said. "I don't think I ever heard any negative comments out of him." Schnurr never met Waldenberger-Bulmer, who started at the railway in November. But Schnurr said he has worked with Waldenberger-Bulmer's twin brother, Jeremy, who is a Canadian Pacific conductor. "I feel like half of me is gone now," Jeremy Waldenberger-Bulmer said in a statement. He said he and his brother planned to work their entire careers at the railway together before retiring to play golf around the world. "My 19-month-old daughter is walking around saying 'Unco Dano' as a constant reminder he is still with us. Myself, my wife Merika and our daughter Tenley feel an emptiness in our home that is indescribable." "This territory's among the most challenging railway territory in North America," Transportation Safety Board senior investigator James Carmichael said Tuesday. Canadian Pacific said it has started its own investigation and will fully co-operate with the Transportation Safety Board and Transport Canada. It said CP crews, contractors and agencies are working to remove the damaged rail cars and equipment. That is expected to take "a number of days." "I have not stopped thinking about this incident since it occurred," president and CEO Keith Creel said after a day at the derailment site. "We have to continue to keep each other's backs, especially in this situation," he said. "The company's got grief counsellors and crisis counsellors available, which is definitely helping. We're all discussing it among ourselves. It helps get the feelings out." counsellors and crisis counsellors available, which is definitely helping. We're all discussing it among ourselves. It helps get the feelings out."